SpaceX is expected to complete its investigation into why the second stage engine on the Falcon 9 launched last month didn’t relight as planned, while the company also moves on from its Grasshopper reusable test vehicle, a company executive said this week. While the launch was a success, placing the Canadian CASSIOPE space weather and technology demonstration satellite and several small secondary payloads into orbit, the vehicle’s second stage engine failed to relight after satellite deployment as a test. That failed relight attracted scrutiny from some observers, particularly after Air Force satellite tracking indicated the existence of a number of additional objects beyond the satellites and upper stage, which some interpreted as debris from the upper stage that may have been linked to the failed reflight. Shotwell, talking to reporters after her ISPCS speech, said the investigation into the failed relight is nearly complete. “We should finish up on Friday,” she said, a timeline that would given insurers enough time to review the report before the company’s next scheduled launch, of the SES-8 commercial communications satellite, now planned for November 12. Unlike the CASSIOPE mission, the SES-8 launch, as well as another commercial communications satellite planned for launch in December, will require the second stage engine to relight to place the satellites into the proper geostationary transfer orbit. Shotwell, though, emphasized that the failed relight didn’t mean the launch was by any means a failure. “Let’s be clear: that mission was a success,” she said. “This flight was a complete success. We had no mission requirement to do a relight of the second stage, so it was a success.” Performing three successful flights, as determined by meeting all mission criteria, is a milestone required by SpaceX to be certified by the Air Force for future launches of military payloads. Shotwell, in her speech and in talks with reporters, also discussed the next stage of the company’s efforts to develop reusable launch vehicle technology. The October 7 flight by the company’s Grasshopper test vehicle, where the vehicle went to an altitude of 744 meters before landing vertically, was the last planned flight of that vehicle by the company. SpaceX is now moving on to a full Falcon 9-R (“Falcon Niner”) first stage equipped with flight-weight, retractable landing legs, for test flights at Spaceport America in New Mexico starting in late December. Grasshopper and the Falcon 9-R test vehicle are two of the company’s steps towards reusability. SpaceX also conducted a test of trying to recover the first stage on the Falcon 9 v1.1 launch last month, firing three of the first stage’s nine engines after stage separation as it reentered the atmosphere, and tried firing the the center engine again before landing. That second relight didn’t work well, though, because the stage was spinning fast enough (due to aerodynamic forces) to push the remaining propellant against the walls of their tanks, shutting off the flow of propellants to the engine. In her ISPCS speech, though, Shotwell showed a photo taken of the first stage when it was just three meters above the ocean, immediately before splashdown. (That photo was also included in the SpaceX update on the launch). The stage was still “fully intact” at that time, she said, although “it didn’t remain intact after it hit the ocean” an instant later. Am I the only one disappointed the Grasshopper (name) will be shelved with the rig? With the goals of SpaceX; short hops to orbit, our Moon, and even Mars seem like they’re just the beginning of inevitable capabilities. I can envision kids of all ages running around with their (must have) green SpaceX shirts. There’s no doubt these historical hops have captured peoples attention. Here’s hoping the (name) brand lives on. I’ve been following SpaceX since Day 1. What amazes me is me is how the rest of the industry is sleepwalking into being utterly irrelevant. A truly inspiring company, vision and team. Just watching SpaceX employees at the lauches is wonderful, I envy them their undoubted place in history, what an awesome team. What’s the first thing a NASA astronaught will hear upon laning on Mars? What is intriguing is that Tesla Motors is doing the same thing for big car industry. Tesla published Model S what was the best car ever manufactured and yet big car industry continues to produce unpractical electric golf-carts that no-one wants. Elon is driving not only superpowers such as United States, Soviet Union and Communist China into their knees, but he is also destroying the traditional car industry what is an epitome of Capitalism. I imagine once the “Orbital Grass Hopper” stage has been perfected and proven practical all of the other spectator rocket manufacturers will try their best to discredit the achievement. They’ll do this whilst in a frantic scramble to emulate. All I can say is SpaceX please continue to lead the way to make the “impossible” “possible”…. I’m really enjoying watching these wonderful developments! SpaceX has said they’re going to fly F9R-1 (GH2) around December, launching from ex TT ended legs. They also want to try another landing with Dragon CRS-3 in February, and if a set of landing legs are ready they’ll use them. They’re also supposedly talking to KSC about a landing site and the FAA about a permit. Why test in New Mexico, rather than from Cape Canaveral or Vandenberg, since they will eventually launch/return from each of them anyway? Too much red-tape delay re authorizations and windows? Too good an offer from NM? Why have a F9R-1 GH2 at all, with it’s cost/risk, since it costs nothing to test landing with an actual CRS V1.1 stage? Remember that Elon stated that all necessary reuse pieces are already in place. It would be better to find a bug via losing GH2 rather than lose the CRS-3 booster. I would think the primary value of GH2 would be to demonstrate a F9R launch with folded legs… to reassure customers (Nasa) that the legs will not imperil a launch on CRS-3.. Therefore I would expect SpaceX to make the initial GH2 launch a full up full speed launch with folded legs… Not risk losing the GH2 airframe with other activities. New Mexico is probably cheaper, regular launch sites are set up for high value launches which can be quite expensive. Also there’s a lot more wilderness in NM, I doubt Nasa would be happy if the GH2 accidentally fell on their assembly building. It’s old but they’re kinda attached to it (they’re sentimental like that). In this risky business the value of testing cannot be understated. Its a testament to the amount of testing performed away from the Vandenberg launch that they came so close to succeeding with first stage recovery. Some of the pieces they needed to complete the puzzle, which Elon referred to, would no doubt have been acquired during the GH1 tests. Yes they would much prefer to lose the GH2 than lose the first stage in front of an audience at the Cape. There are always political and commercial considerations which need to be taken into account when deciding where and how to test. As to your final question: I’m sure at some point they will test GH2 will legs folded but it will be far less complicated and safer to have the initial flight with legs akimbo. Small steps lead to giant leaps. Incidentally I did hear the GH2 maiden flight will be from Mcgregor TX soon but have seen no confirmation. Looking forward to it wherever. 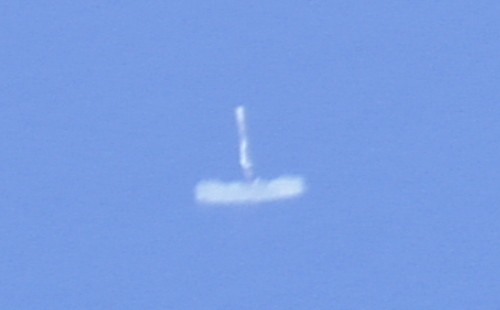 I believe Shot well confirmed early F9R-1 hops atcGrehor late last week. As for New Mexico, SPA is very close to a white Sands so some coordination will probably be necessary. OTOH – big drop zones. IMO: the upper F9R flight profile tests will mostly be done with F9 v1.1 launches, some with legs, and F9R-1 will do the lower flight profile, approaches and land touchdowns in NM. Once they align a full up F9R launch from KSC – maybe a CRS flight. Birds can fly, grasshoppers can only jump. Falcons are raptors. I’m unaware of raptors that hop but grasshoppers, fleas, and crickets do. Which would you have preferred? Jeff, can you get a firm answer on the question of whether the F9R-1 test vehicle will have 9 engines or not? The statement from Shotwell that it will be “as flight-like as possible” suggests it will have all 9 engines. But discussions on NasaSpaceFlight.com suggest it will only have three. Giving this test vehicle only three engines would make sense since only three are used during the actual descent, and you would avoid an expensive loss of all 9 engines during a failed test. However, giving it all 9 engines and a full fuel load does have an advantage. If you apply the rocket equation to the claimed 311 s Isp and 20+ mass ratio of the stage, you see the first stage can be SSTO. This would be a major technical advance for SpaceX to accomplish. 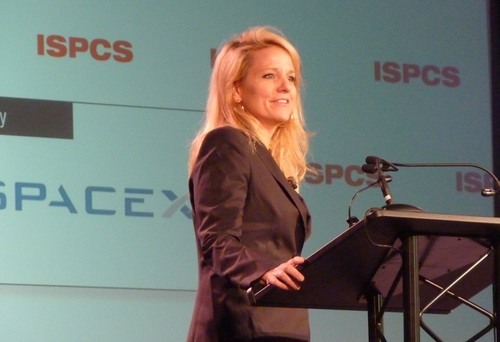 Gwynne Shotwell is a rock star! AWESOME!! What’s with the attempt to use an engine relight to slow down the Falcon 9 v1.1 first stage before water impact? Why not just use parachutes? Worked fine for the SRBs. The SRB parachute systems added about 5% to the return weight of an SRB. What’s 5% of an F9, 2000-2500 lbs? The SRB was also a much tougher steel structure that could take the forces of reentry deceleration. The light structure of an unreinforced liquid stage cannot survive that without a retro burn. The question is, what method takes less mass, and facilitates reuse better. If boost back fits the requirements better, that’s your answer. That said, those that just write off parachutes as an obsolete technology are just as closed minded as those that say boost-back can’t be done. Actually they tried using chutes on Falcon 9 v1.0 and abandoned it. It’s just not workable for what they’re trying to accomplish. This is actually their second attempt at reusability. The SRB’s dropped off lower down and slower. When SpaceX tried them with the lighter/smaller F9 1.0 cores they didn’t survive. Adding energy isn’t going to fix that. Spacex did not truly engineer their parachute recovery system. They bought some off-the shelf cargo parachutes and attached them to the booster. It was not a serious attempt at recovery, it was a why-not experiment carried out after the mission objectives were satisfied, which is a fine approach, BTW. However, the stage structure was not designed to survive the reentry/ deceleration forces and it came apart. Those results have no bearing on the viability of parachute recovery. Even in a boost back mission there may very well be an application for a parachute to provide passive orientation, ullage force, etc. Interesting pic. But judging from the location of the spray relative to the bottom of the rocket, and knowing the length of the stage, I’d say it was more like 15 meters from touchdown. The pic seems to show the engine still firing (or just in the process of stopping) so they must have been really close to success. I was thinking that the engine had quit at a much higher altitude than what this shows. The picture was taken from an aircraft using a powerful zoom lense. So there is an extreme angle and lots of atmospheric blur causing it to look weird. It really is 3 meters away. The engines are actually IN the spray so you can’t see them. SA’s advantage is no planes flying overhead, since it’s near White Sands Missile Range.